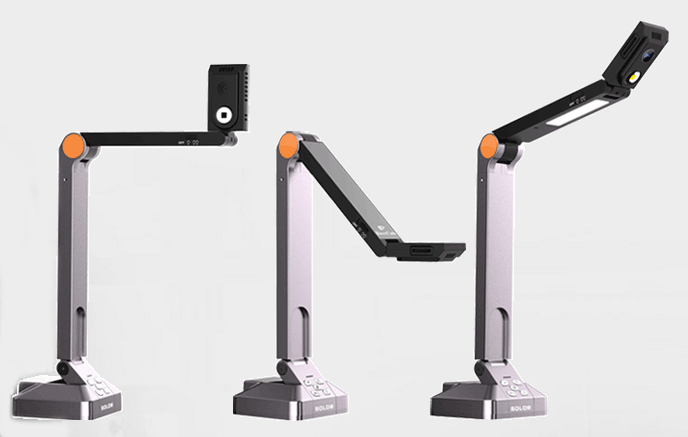 Solo 8 is possibly the best document camera ever built. It is the world’s first SuperSpeed USB 3.0 document camera delivering brilliant 8-Megapixel resolution and stunning 30 frames-per-second full motion video. With the Solo 8 the finest of details come to life and video becomes captivating and truly lag-free. Experience 4 x the clarity of a 1080p HDTV for truly captivating lag-free video. It’s more Hollywood than document camera. Half the cost, higher performance: We’ve replace pricey optical components and leverage the power of your classroom computer. Record video directly your your computer’s hard drive: Not limited by SD cards. Transfer easily to YouTube,TeacherTube, your website or other sharing service. Make your point: Easily annotate video to communicate ideas more clearly. Simply Scantastic: Scan sizes from business card to larger than tabloid; Multiple-page PDFs too! HoverCam Saves Teachers’ Precious Time: HoverCam saves teachers time allowing them to scan at their desk without going to the office. It allows them to quickly record flipped classroom videos directly to the computer, saving time compared to recording with a smartphone or video camera then downloading to a computer to edit. Because HoverCam is USB powered, teachers save time setting it up. And, using HoverCam’s GradeCentral software (or another grading program) teachers save time grading multiple choice tests using the same HoverCam. Save Desk Space: HoverCam’s base--just 4” in diameter-- is significantly smaller than traditional document cameras saving space on a teacher’s desk. Using the HoverCam’s scanning and file management capability to digitize paper can help reduce desk clutter. HoverCam Helps Teachers Teach Better and Students Learn Faster: Using a HoverCam helps teachers visually communicate concepts in ways that allow students to comprehend information more quickly. Advanced Technology from an Innovative, Reliable Company: HoverCam is the technology leader in USB document cameras for schools. Many of the company’s innovations are patented or patent pending. 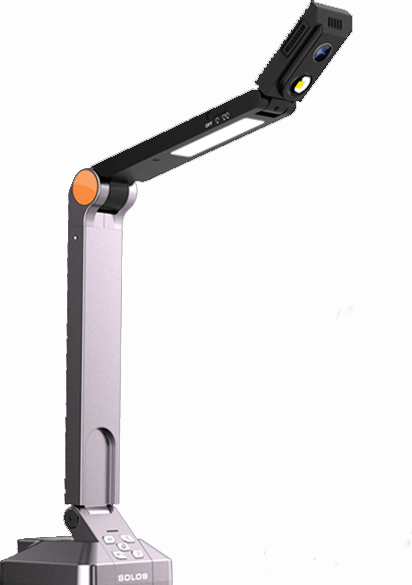 The company’s accomplishments include: First high quality USB document camera. First document camera incorporating two cameras. World’s Fastest 5-megapixel USB document camera. World’s Smallest Document Camera. Over 100,000 HoverCams are in use at schools across North America, and new users are added every day. Scan Right At Your Desk: HoverCam includes software for scanning and managing scanned images. Save time scanning pages from a book, newspaper, magazine and students’ homework right at your desk. Easily Create Instructional Videos for Flipped Learning: The HoverCam includes a built-in microphone. Use the HoverCam to conveniently record HD quality video with audio directly to your computer’s hard drive. With the HoverCam, it’s easy to create your own instructional videos for the flipped classroom and flipped learning. Clear Pictures 2X HD 1080p Resolution: Expect superb image clarity from the HoverCam when compared to document cameras three times the cost. The HoverCam allows you to zoom in and out in real time with the spin of the mouse wheel. Combined with the ability to click and drag an image, you have maximum versatility when presenting and teaching. It’s a great way to show worksheets, book pages, rocks and even your iPad or tablet screen. HoverCam’s 5-megapixel camera sensors are twice the resolution of HD 1080p. Industry Leading HoverCam Flex Software: HoverCam Flex software is regarded as the best software of any document camera. It allows you to scan, record video, manage and share files, and more. It even works with interactive whiteboards, allowing you to easily show captured images and live video on your interactive board. And, the software is embedded inside the unit, making it easy to install anywhere without having to download from the Internet or find a misplaced CD. Distance Learning & Remote Conferencing: The HoverCam image appears in a window on your computer screen, which means high resolution images of documents and objects can easily be viewed during remote conferences and distance learning sessions with Skype, GoToMeeting, Zoom, WebEx and other web conferencing programs in “screen sharing” mode. In addition, the HoverCam includes HoverCam Connect, a beta software feature that allows two HoverCam users at remote locations to share each other’s viewing screens and images over the Internet. The HoverCam provides sharper, clearer images in distance learning sessions than a typical low-res webcam. LED Lighting That Never Needs Changing:Have a dark room? No problem. The HoverCam camera works well in low light, and if your room is completely dark, the unit incorporates long-lasting LED lights. For the price of the replacement bulb of some older traditional document cameras, you can buy a HoverCam. Engineering Masterpiece: The HoverCam is designed to leverage the processing power of the computer to zoom and control most functions, so the HoverCam doesn’t incorporate the large and expensive optical parts found in traditional document cameras. The result is a patented, new form factor that’s compact, portable, durable and affordable. In summary, the HoverCam does more and costs schools less.